The direction of twist in a yarn, along with your method of knitting or crocheting, affects whether it splits as you work. Have you ever looked at stitches you've just cast on to find that you don't have neat, distinct strands and it's even difficult to count them without physically separating the fibers? Is it a problem with the yarn? No. As you can see in the next picture, a further 10 stitches have been cast on, but this time they are all clearly distinguishable. So what's going on? The answer lies in the twist. Twisting fiber imparts strength to a yarn. It makes the fibers harder to pull apart lengthways and the yarn therefore harder to break. You can twist in either direction. If you hold a length of fiber one end and twist the far end to the left you get an S twist in your yarn. 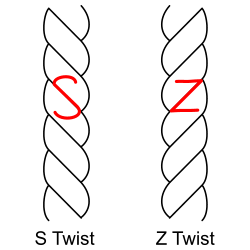 If you twist to the right instead you get a Z twist. Most manufactured single plies are spun with a Z twist. To ply these Z-spun singles together they are spun with an S twist to give a balanced plied yarn. Almost all yarns available to us as knitters and crocheters are made in this way, i.e. Z twist if they're single ply and having a final S twist if they're plied. 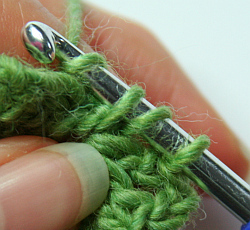 Knitting or crocheting with a yarn changes the amount of twist. How it changes depends on the final twist direction of the yarn and the direction in which you wrap the yarn around the needle. Does that matter? Adding more twist to your yarn causes it to tighten up, making it slightly stronger and less susceptible to pilling, and also making the stitches easier to work and less likely to split. Reducing the twist in a yarn makes the fibers and plies separate and it is more difficult to work without splitting the yarn. 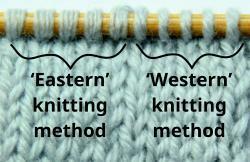 A note on different knitting methods: Most knitters in America / UK / Western Europe / Australia are 'Western' knitters - the right hand leg of the stitch sits at the front of the work, i.e. closest to you on the needle. Whether you hold the yarn in your right hand (English or throwing style) or your left hand (Continental or picking style) you are still using the 'Western' method. 'Eastern' knitters have the right hand leg of their stitches on the far side of the needle, work into the back of all their stitches, and take the yarn round the needle in the opposite direction to form a new stitch. The 'Combined' method uses a mix of the two. So the good news for most 'Western' knitters is that they introduce more twist into the commonly available S-plied yarns. In this picture, showing a swatch I made using an S-plied yarn, the stitches on the needle have plenty of twist where they were made with the Western knitting method, but the plies have separated where the Eastern method was used. For crochet, the opposite is true - in the pictures below, the plies of the S-plied yarn have separated, while the stitches of the single with its Z twist are tightly spun. What does that mean for your knitting and crochet? The twist in your yarn can make the difference between sailing along row after row, hardly looking at your work, or finding that you split your stitches if you don't pay close attention. Of course that doesn't mean that a knitter has to learn the Eastern knitting method in order to enjoy a single ply yarn, and crocheters are very used to working with S-plied yarns. After a few rows your fingers become used to your yarn and the level of care that you need to take to form stitches with it. Plus any stray loops in your knitting can often be fixed by dropping a stitch down to that point and collecting them in. But it is easier to work with yarn when you are adding twist as you work. Many crochet cotton threads are Z-plied for this reason and there are a few Z-plied yarns available for crochet and also for twined knitting, a technique which leads to excess twist in an S-plied yarn. 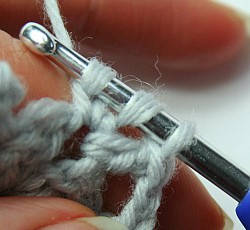 Yarns with a 'cabled' or 'crepe' construction also usually have a final Z-twist. In these yarns, singles are Z-twisted, then plied together with an S-twist, then those 2 ply yarns are plied together again with a final Z twist. Cable yarns are said to be very hard-wearing and less susceptible to pilling, though all that plying means they won't feel as soft as a yarn with a lower total twist. You can search on YarnSub for any of these Z-plied yarns. Even if you can't get hold of a Z-plied yarn, at least avoid using a loosely S-plied yarn for crochet, since you'll be taking even more twist out as you work with it. And if you don't like the lack of twist (as in the picture at the top) that results from using a Z-spun single ply yarn for a cable cast on, try working it the 'wrong' way: wrap the yarn for the new stitch over, down and round the needle (rather than under, up and round), and slip the new stitch off the right hand needle by moving the left hand needle through the new loop towards you, not away from you. Both of these actions add twist to a Z-spun yarn instead of removing it and make little difference to the look of the cast on edge.